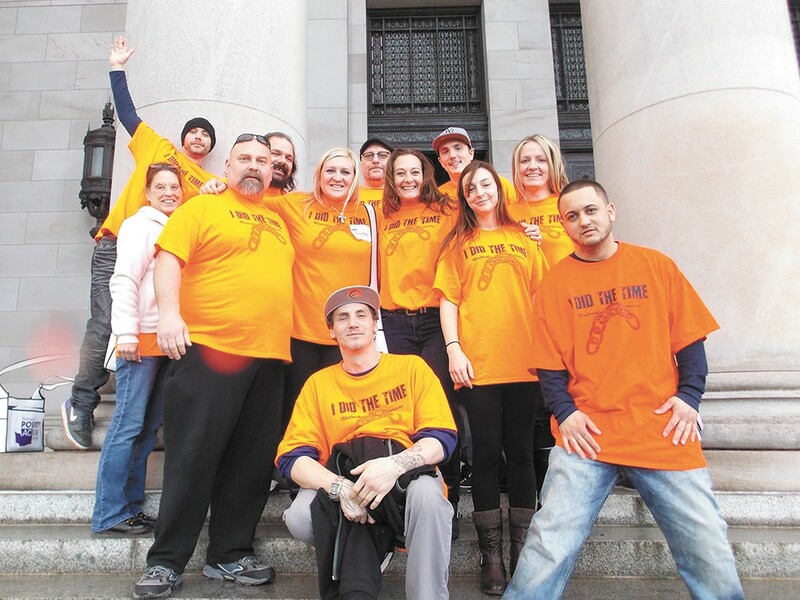 Members of I Did The Time group traveled last year to Olympia to lobby for bills that would make it easier for felons like them to pay off their court fees and find a job. Like most of the crowd gathered here in a loose circle in the Community Building atrium, eating pizza on a Wednesday night, Layne Pavey is a felon. She'd spent 20 months in prison for her role in her ex-boyfriend's cocaine dealing business. When she got out, she was ready to turn it all around. "I was really excited to rebuild my life," Pavey says. "I spent a lot of time doing treatment, learning about myself, trying to avoid making mistakes again." Then she learned just how the scarlet letter left by her felony conviction lingered. "The saddest part to me was getting out thinking I could move on, and running into so many walls," Pavey says. "You think that you're free, and you're actually serving life. We don't think that's just." Two years ago, Pavey formed this lobbying group — I Did The Time — to fix precisely this problem. The gathering here is diverse in age, race and gender, but most all of them are felons. For some, it's been decades since they were behind bars. For a few, it's been only a matter of days. On Martin Luther King Jr. Day, they'll all pile on a bus and trek across the snowy mountain pass to Olympia, in order to lobby Washington state's legislators to fix the issues that plague felons after they've been released. To do so they'll have to convince a legislator who's one of Olympia's most skeptical regarding reform — Spokane Valley Sen. Michael Padden. "What have you wanted to do in your life that was hindered or blocked by your criminal record?" Pavey asks the crowd. They answer quickly. "Get a job!" one woman says. "Any job... It's like background check! You're f—-ed! I've been homeless up until a month ago, looking for work, like, six months." Another says she wanted to be a nurse, but learned that was impossible. "There was no way to get a license because of my felony background," she says. Others say that all they really want is to serve in the armed forces or get a housing voucher. One young man quips dryly that because he's a felon, he can't even get a house in Spokane's "Felony Flats" neighborhood. Each problem exacerbates the others. When felons leave jail, they're often left with thousands of dollars of fines and court fees that keep increasing due to unpaid interest. Because they're felons, they're barred from getting licenses for jobs — like barber, dietitian, telephone salesman or commercial fisherman — that could help them begin to pay off those fees. Even the jobs they can apply for often ask them to check "felon" on their application, dooming their chance of getting an interview. Rep. Kevin Parker says he was moved to tears after hearing the story of an I Did Time member last year. Pavey explains they have three bills they want to lobby for: First, there's a Legal Financial Obligation reform, which would slash LFO interest rates, prioritize compensating victims first and define when courts cannot impose LFOs and when courts cannot jail people who can't pay. Next, there's the Certificate of Restoration of Opportunities (CROP) Act, which would allow judges to give some rehabilitated felons a certificate making them eligible for certain occupational licenses. Finally, the Washington Fair Chance Act would "ban the box" — preventing private businesses from immediately asking applicants about their criminal history. Businesses can still run background checks, of course — and aren't required to hire any applicant, but felons would have a chance to explain their convictions if they're otherwise qualified for the job. Last year, the LFO reform bill and the CROP Act passed through the House with bipartisan, overwhelming margins: The problem is the Senate, Pavey says, where Padden sits on the Law and Justice Committee as chair and gatekeeper. "He has turned down every kind of criminal justice reform bill that any person has put in front of him, regardless of research, regardless of evidence and regardless of the voice of actual people who are facing injustice," Pavey laments to the audience of felons. "He won't even meet with us face to face." "We'd love to get to know him," Pavey says about Padden. "We would love a chance to let him look us in the eye, and tell us why he's not willing to give us a more fair chance." Padden says he's willing to meet with pretty much everybody, and believes that I Did The Time is already on his schedule for next Monday. A former district court judge and collections attorney, Padden has a decades-long reputation for favoring harsh measures against criminals. When county commissioners appointed him a district court judge back in 1995, The Spokesman-Review noted he was a "lock 'em-up conservative" who supported the death penalty even for some juveniles. In the years since, Padden notes, he served as the presiding judge for Spokane's evidence-based DUI court. He was skeptical of the program at first, but witnessed how, for certain offenses, the court's structured rehabilitation program could be more effective than incarceration. "I would say that public safety is important, and I believe in rehabilitation," Padden says. "Obviously you've got to seek justice, too." Last year, he was named the state's "Legislator of the Year" by Mothers Against Drunk Driving after pushing for a bill to make an individual's fourth DUI in a decade a felony. Amid the "Smart Justice" sentencing reform push in 2014, Padden wrote an op-ed countering that "reducing punishment doesn't reduce crime." He also was one of only two senators to vote against a reform bill last year to eliminate many legal financial obligations for juveniles. Sen. Michael Padden has been skeptical of recent reform proposals. "Some of these things are all about being responsible for your obligations," Padden says. "There are a lot of people in Seattle that don't think that any juvenile should be incarcerated, ever." Padden's committee, Pavey says, significantly watered down the LFO reform bill that the House passed. Padden argues that the House's version had serious holes: Many county clerk offices didn't have the technology to make the changes required by the bill, and county clerk offices often relied on Legal Financial Obligation payments to operate, and the bill didn't give them another revenue stream. Though the CROP Act was passed unanimously by the House, Padden says it also had major problems; it never made it out of his committee. "It gave liability protection to the state, but none to cities and counties and to companies," Padden says. "I don't want a [Certificate of Restoration of Opportunities] for someone convicted of fraud who then is working at a title company as an escrow agent." Padden says he's waiting to meet with House Democrats to work out the bill's deficiencies. "The long-term strategy is not to get angry, despite how angry you may be," Pavey tells the I Did the Time members. "The long-term strategy is actually to build relationships with these people." 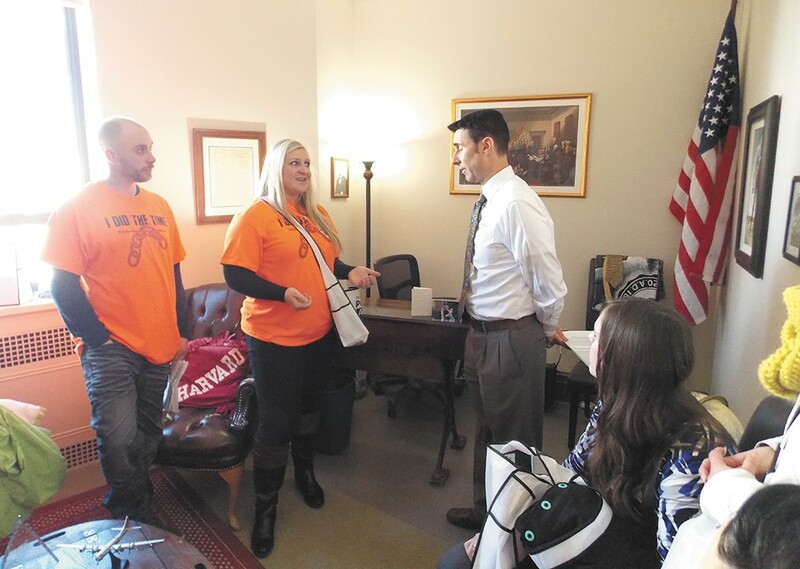 Last year, the group wore orange T-shirts on lobbying day — a riff on orange prison jumpsuits — with "Outmate" written on the backs. This year, Pavey says they'll split up into groups, targeting specific legislators. "Try to find one particular story, or two particular stories to share," Pavey tells her. "You're going to have four minutes... to say, hello, here's who I am, this is why I'm here, and there was one time — because this is my record — this happened." Some of them will bring their kids for an extra emotional punch. "We've got a veteran we're going to take in with us," says I Did the Time member Dom Felix, a big, bearded man. 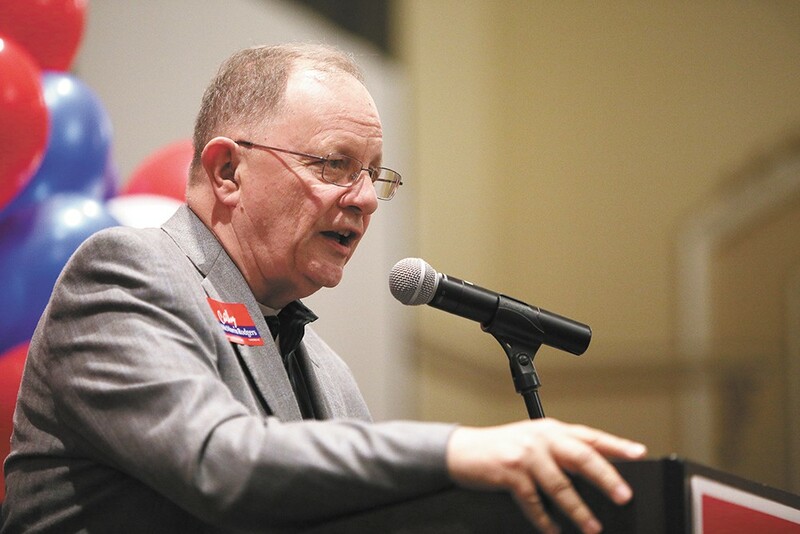 "Mike Padden is sympathetic to veterans' rights." Felix says he can talk about his own experience — how even he, a lifelong career criminal — can eventually change. He can talk about how the 12 percent interest on his thousands of dollars owed in LFO fees keeps his debt climbing faster than his $50-dollar-a-month payments can pay it off. "I don't know that we changed anyone's mind," Felix says about last year's lobbying effort. "A big chunk of what we do is not so measurable. We change the culture around ex-felons." Sometimes, their stories do change minds. Last year, one of those stories literally moved Rep. Kevin Parker, a Republican, to tears. "There was a guy who was married and had a little girl and was trying to put himself through school, but it was very difficult," Parker says. It had been a decade since the felon had committed his crime, and it seemed he'd been rehabilitated, but he was still struggling to find work. For some of these people, Parker says, it had been five to 20 years since they've even had a speeding ticket on their record. Parker isn't sold on every detail of every bill being proposed — he's not so sure about the fine print in the Fair Chance Act — but says his conversations with I Did The Time sparked a philosophical shift. He had a sense for the theory and policy, but this — a personal story — meant that the final piece to understanding the former prisoners' dilemma clicked into place.